Friday was a day of no playset building due to other evening activities, and things were not looking good for Saturday either. It’s been pretty frustrating the past few weeks how each week it’s been beautiful on Sunday (a day of rest when I don’t work on this) but rainy and cold each Saturday. And it was definitely rainy and cold this Saturday but at least in the afternoon, the rain kept itself contained to a mild drizzle and while it certainly wasn’t PLEASANT out, it was at least tolerable. Scott and I ended up going out there at about 2pm and we worked until dinner time. In retrospect, that may have been too much time working in one sitting as I was plenty sore in the evening and had to lie down for the evening as my back was not enjoying life. I had put the rafters on the roof back on Thursday, and so the first task for today was putting on the end boards (that cover the “triangle” part of the roof). The instructions specifically state (and I read them like five times) that there is an opening for a window on the back, and no opening on the front. Which is all fine and good, but the pictures also specifically show a window on the front (the back is tragically absent from any pictures). I didn’t want to mess with the instructions, so I put the window on the back. As I was boarding up the front part of the roof, I realized that I had put the back boards on the outside (at a very high degree of difficulty since it required me being 10′ off the ground on a ladder) rather than on the inside (which would have been much easier as I could have just used the stepladder on the 2nd story floor boards). So chalk that up for a mistake. Luckily it wasn’t too bad to unscrew them from the outside and put them on the inside. Steps 62 and 63 were putting some Soffit Caps on the sides, and it was then that I realized (after way too much wrangling of the instructions and such) that back when I was putting the bay windows in the back that I also needed to put a set of windows on the left side (Step 55 in its entirety: “Repeat procedure on left side Bay Window per diagram”). Of course, the boards did not fit right on this side either – only 2 of them fit. Then while trying to rubber mallet one of the Q12s into place, I snapped it (will have to order another one – Mistake #2 on the day). 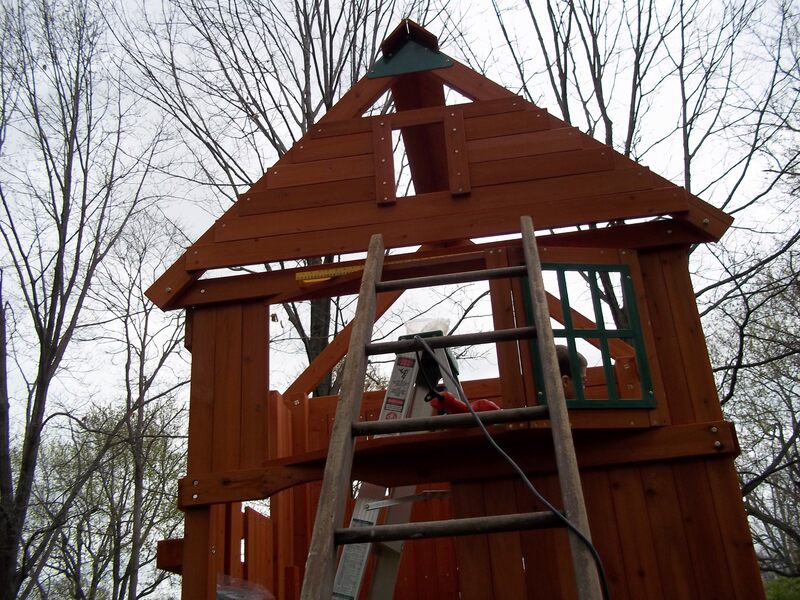 As I’ve mentioned before, Geoff and I are trading playset labor – he’ll be building a playset later this spring and so when he does, I’ll come over to help him. 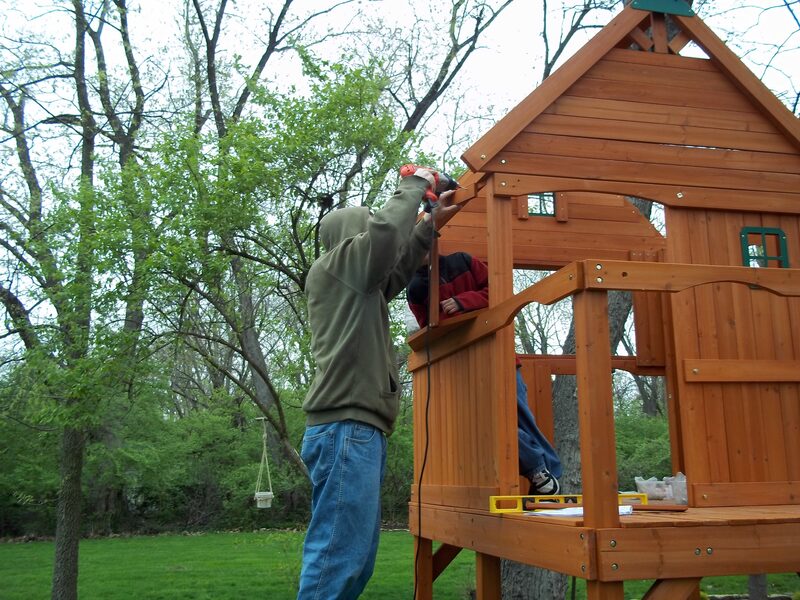 Last time he was here, he joked of another reason why he’s helping me first – that way he can look at our playset and then just one-up whatever we do. 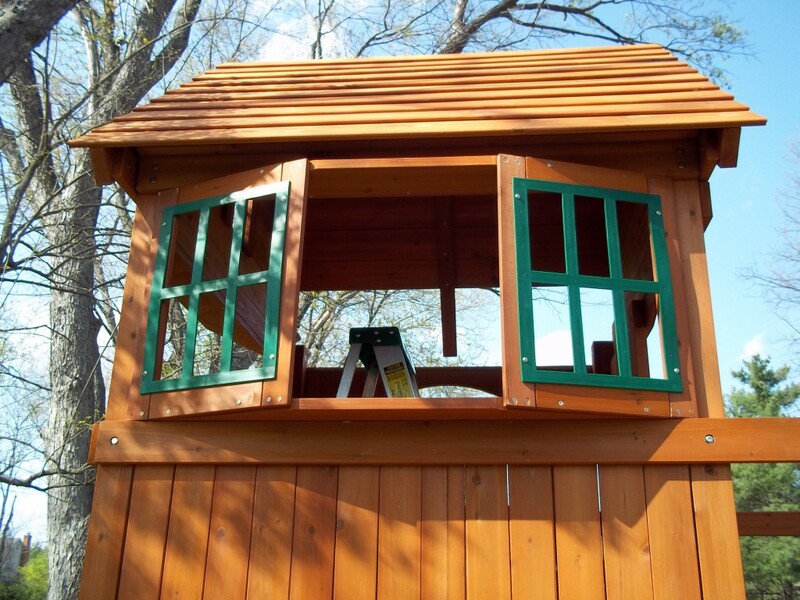 So when we were putting in the first bay windows he said that now he knew that his playset was going to have 2! I guess now he needs to have 3!! After the soffits went in – it was time to put on the rest of the roof rafters. I had put in the top one on each side in a previous step as part of securing the rafters, but now it was time to put the rest of them on (except for 3 rafters on the right side that are intentionally left off until a future step – I believe in conjunction with creating the crow’s nest area). I put the first (new) one on, and then realized that the rafters were on wrong (Mistake #3 on the day!). I’m no roof expert, but even I can tell when the rafters are set up in such a way to have the rain fall INSIDE versus just rolling down the roof. So I had to unscrew those and turn them around. It was a bit tricky to get all the rafters on. The first few on top went okay because I could just put the ladder underneath the empty part, but as I got lower and lower, my opening gradually disappeared. Eventually though I got them all in. My assistant Scott was very helpful in helping pass me boards. Last step for the day was working on setting up the clubhouse porch support boards, and then it was time for dinner. Here’s a shot from the next day – starting to look like an actual clubhouse!! 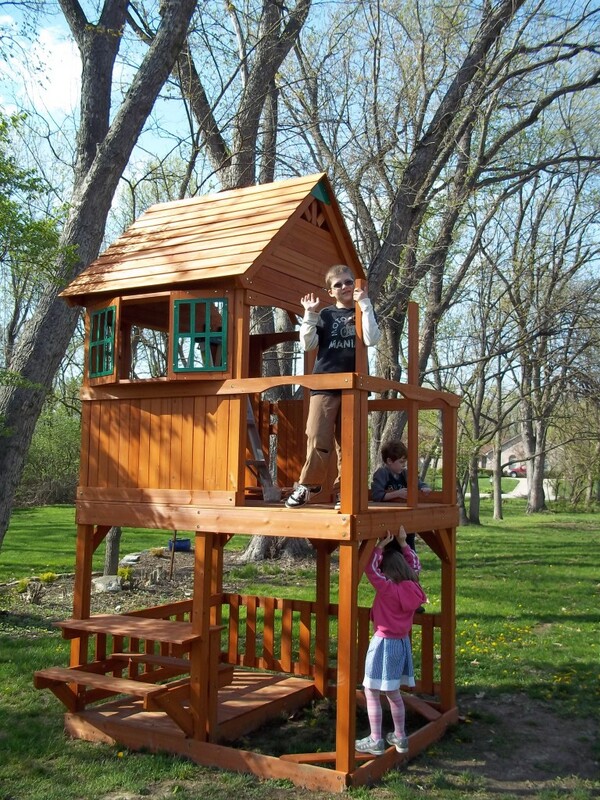 This entry (permalink) was posted on Monday, April 18th, 2011 at 7:23 AM by Dan Miller and categorized in family, kids, skyfort playset. Keep on posting, Dan. I’m having a good time following this project! Dan, thank you so much for this information. I’m doing the bay windows now and have run into at least five mistakes in the manual. I’m planning to go on Amazon and Sam’s Club.com to share my experiences. Question for you…Did you mean to screw your green window frames on from the outside? It’s showing to do it from the inside and the measurements don’t add up to do it… Thanks, Mike.